Heat oven to 375°F. 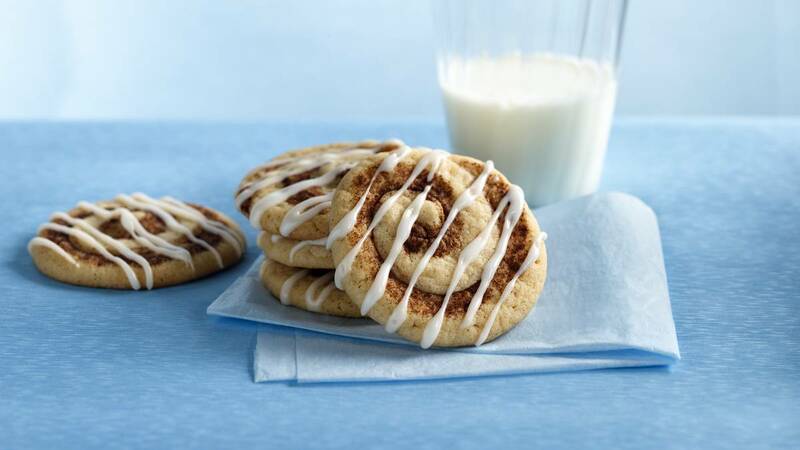 In large bowl, mix cookie mix and 1/2 teaspoon cinnamon. Stir in butter and egg until soft dough forms. On piece of waxed paper, shape 1 tablespoon cinnamon into a line about 5 inches long. Using floured fingers, shape 1 tablespoon of dough into a rope 5 inches long. Press one side of dough rope into cinnamon. On ungreased baking sheet, coil dough rope tightly, cinnamon side facing centre, into cinnamon-roll shape. Press end of rope into roll to seal. Repeat with remaining dough. Place cookies 2 inches apart on baking sheets. Bake 7 to 10 minutes or until edges are light golden brown. Cool 1 minute; remove from baking sheets to cooling rack. Cool completely, about 15 minutes. Success To drizzle the glaze easily, place glaze in a small food-storage plastic bag, snip off a small corner of the bag and squeeze to drizzle glaze over cookies.